His Eminence, Joachim (Alexopoulos) was the first ruling Bishop of Boston under the jurisdiction of the Greek Orthodox Archdiocese of North and South America of the Ecumenical Patriarchate of the area that now is the Metropolis of Boston. He served as Bishop of Boston from 1923 to 1930 before his assignment as Metropolitan of Demetrias in Greece. Little is known of the early life of Father Joachim Alexopoulos. 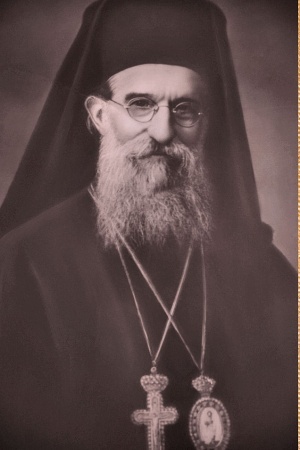 In 1906, Father Joachim Alexopoulos was named the priest of the parish of Saint Sophia (Holy Wisdom) in Washington, D.C. He came to the parish after it had been served by Fr. Nathaniel Sederis and itinerant priests for the first two years after its initial organization. Fr. Joachim served at St. Sophia Church until 1918. In 1920, Fr. Joachim Alexopoulos succeeded Fr. Joachim Malahias as the priest at the Church of the Annunciation in Boston, Massachusetts. Fr. Joachim Alexopoulos came to Annunciation Church at a time when the Greek disasters occurred in Turkey following World War I that caused plans for a new church in Boston to have become dormant. Fr. Joachim revitalized these plans, and a new church was completed in 1924. On June 28, 1923, Fr. Joachim was appointed the first Greek Orthodox Bishop of Boston with the new Annunciation church, which was designated a cathedral, as his seat. During the years as the leader of the Greek Orthodox community in the Boston area, Bp. Joachim helped establish and support new parishes among the Greek immigration. Bp. Joachim served as the ruling hierarch in Boston until 1930. In 1930, Bp. Joachim was called back to Volos, Greece where he served as Metropolitan of Demetrias. The bishop's seat at Boston remained vacant until the appointment of Bp. Athenagoras (Kavadas) in 1938. During the German occupation of Greece in World War II, Metr. Joachim led an effort by residents of the villages of Mount Pelion to hide people from the Nazi authorities. When he was asked for information about Jews he firmly refused their requests for lists of Jewish residents, answering them, "I am a Jew". For saving the lives of some 700 people, he was recognized posthumously, in 1998, by the State of Israel with an inscription in the Holocaust Museum in Washington, D.C. and on the Righteous Honor Wall at Yad Vashem  in Jerusalem. God's Holy Wisdom in Washington, D.C. This page was last edited on April 25, 2013, at 00:13.